Despite the availability of an official build of Mozilla Firefox for Mac OS X I've always liked and preferred using Camino, not because it shares it's name with a liqueur, but because it uses Aqua instead of Mozilla's standard user interface. This means it's noticeably zippier when running and starting up, the binary is much smaller and the design matches all my other Mac programmes. As Mark Shuttleworth, the South African behind Ubuntu Linux and the first African in space so famously put it: Pretty is a feature! That said I've been a user of Mozilla Thunderbird for a long time, mostly for future proofing reasons. Because it's open source and the data files it generates are also readable on other platforms it just made me feel more comfortable. I'm always imagining a scenario in the future where I switch over to Linux or FreeBSD full time; I would hate to move across all that data. With all the work I have these days it's so liberating when a piece of software comes out that just makes life simpler… and look better. Am I right? 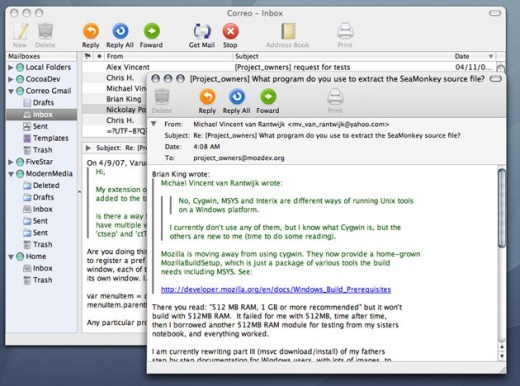 In this case I stumbled upon a new email client for Mac OS X called Correo. It's at a fairly rudimentary stage right now but it's fun to tinker around with. I can't wait for it to be really fleshed out.